Formwork for interior and end beam and floors are shown in Fig. Various parts of the formwork are shown in the same fig. Sizes of various elements and their functions are given in brief. Cleats are fixed to the sides of the beams. The size of the cleat is 100 mm x 20 mm or 100 mm x 30 mm. 2. Side forms of the sheathing of the beams are generally 30 mm thick. Joists support the decking. The size of the joists depends upon the c/c spacing of the joists and span of the joists. Joists are also known as battens. Ledgers are horizontal wooden pieces nailed to the cleats. They form the bearing for joists. It should be made 50 mm to 70 mm thick as load is quite heavy over it. The whole of the beam is supported on a head tree. It is a horizontal beam connected at top of the vertical post or shore, through inclined cleats or beams. At the bottom of the vertical posts or shores, a pair or wedges are fixed over sole pieces. Wedges help in tightening or slightly raising the formwork to develop initial camber in the formwork. Wedges are withdrawn while stripping the formwork. Formwork should not be stripped at once, but should be loosened slowly by withdrawing the wedges slightly in stages. 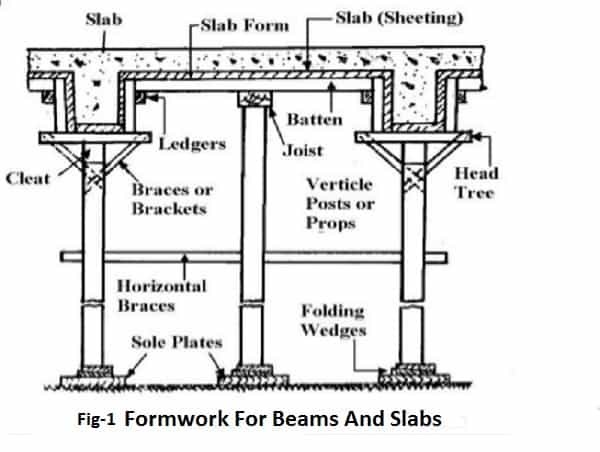 All the construction joints in beams and floors should be made in the middle third of the beam. Also Read – How To Build Good Formwork At Site. If you found this article then please subscribe to our newsletter.